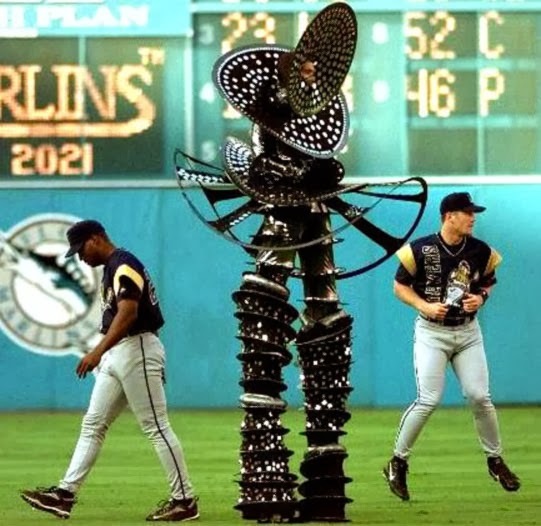 Out of all the colorful and occasionally zany uniforms the National League Milwaukee Brewers have worn in the last forty-plus seasons, few seem to have captured the imagination of fans more than the "Turn Ahead the Clock" jerseys worn in 1999. For a game in Miami, the True Blue Brew Crew wore bold futuristic pull-over jerseys featuring their original logo, the Beer Barrel Man (nice to see he'll make it to the uniforms by 2021). I'm frequently asked about these jerseys - in the days before ubiquitous internet commerce, when authentic jerseys can be bought before they even see the field, retail versions of this one were very hard to find. They were only available at the clubhouse shop in Brookfield Square and at County Stadium. Now there's one up for sale on eBay. This is the genuine authentic Milwaukee Brewers 1999 "Turn Ahead The Clock"Jersey. Size 48 by Russell Athletic. This jersey may have been lightly worn. There are no snags, pulls, holes, tears or stains. The main color is royal blue with the barrelman graphic and gold short sleeves. 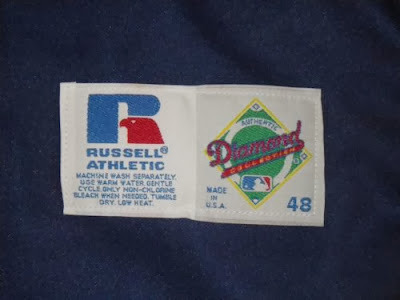 Russell Athletic Authentic Diamond Collection 48 tag is sewn on the front lower left. Made in USA. 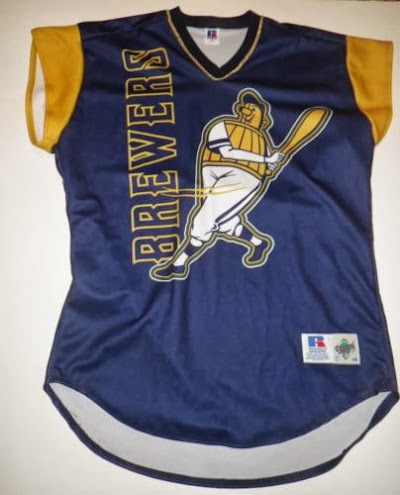 One of the most popular of the TATC jerseys with the 1947 Milwaukee Brewer swinging barrelman. No number on the reverse, a great fan jersey!!! Don't see these come up too often. I already have one in my Brewer collection, perhaps you can add one to yours now. Happy bidding!